Huevos Divorciados is a Mexican dish that translates as 'divorced eggs' because of the two different coloured sauces. 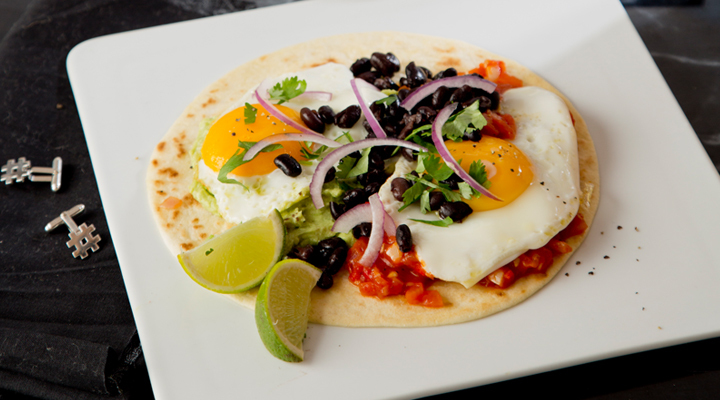 It differs from Huevos Rancheros, which traditionally has a spicy tomato sauce only. 1. To make the green salsa, blitz the jalapeños in a mini blender until finely chopped. Add the remaining ingredients and pulse to combine. Season with salt and pepper. 2. To make the tomato sauce, heat the oil in a small pan set over a medium heat, then fry the onion for 3 to 4 minutes, until softened. Add the garlic and fry for a further 2 minutes. Stir through the chopped tomatoes, red chilli and tomato purée along with 100ml of water. Simmer for 12 to 15 minutes, until the sauce has reduced and slightly thickened. Season to taste. 3. While the sauce is cooking, heat 1 tablespoon of oil in a large frying pan over a medium heat. Put two tortillas together and fry in the pan for 2 minutes. Flip over and cook for another 2 minutes, until golden. Remove from the pan and set aside. Repeat with the remaining tortillas. 4. Using the same pan, fry the eggs in batches in the remaining tablespoon of oil for 5 minutes over a low heat. 5. To serve, arrange one tortilla on each plate. Smear one side with avocado salsa and top with an egg. Spoon the tomato sauce over the other side and top with another egg. Sprinkle over the black beans, red onion, sour cream and coriander leaves and serve with lime wedges on the side.